Fall has begun and people are looking forward to Pumpkin Spice Lattes, leaves changing colors and parents sending kids back to school. If you’re in need of a few dinner suggestions using this season’s produce, try the recipes listed below. They’ll be a great way to eat and pack your veggies in at dinner. 2. Place pizza crust on a baking sheet coated with cooking spray. Arrange apple slices evenly over pizza crust; top with cheese. Sprinkle thyme evenly over cheese. Bake at 450° for 8 minutes or until cheese melts and begins to brown. 3. Combine oil and next 3 ingredients (through honey) in a medium bowl, stirring with a whisk. Add arugula; toss gently to coat. 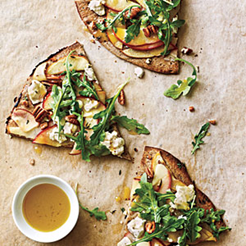 Sprinkle pecans evenly over pizza; top with arugula mixture. Cut pizza into 6 wedges. Boiled salad dressings—which aren't actually boiled but heated gently in a double boiler—are butter-based vinaigrettes that became popular in the South, due to the onetime lack of good-quality vegetable oils at one time. 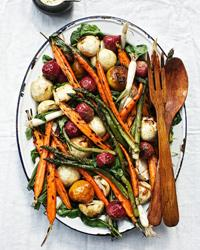 In this version for a grilled-vegetable salad, Hugh Acheson gently cooks egg yolks, spices and vinegar until silky and light, then whips in the luxuriously rich combination of butter, cream and crème fraîche. Preheat the oven to 400°. Put the beets in a small baking dish, cover with foil and bake for about 40 minutes, until tender. When cool enough to handle, peel and halve the beets and transfer to a large rimmed baking sheet. Bring a large saucepan of salted water to a boil. Add the carrots and boil over moderately high heat until crisp-tender, about 4 minutes. With a slotted spoon, transfer to the baking sheet. Add the turnips to the boiling water and cook until just tender, about 3 minutes; transfer to the baking sheet. Repeat with the asparagus, cooking until bright green, about 2 minutes; transfer to the baking sheet. Add the leeks and cook until just tender, about 2 minutes; transfer to the baking sheet. Halve the carrots, turnips and leeks lengthwise. Drizzle the vegetables with olive oil and season with salt and pepper. In a medium stainless steel bowl, whisk the egg yolks with the vinegar, flour, mustard, sugar and cayenne pepper until smooth. Set the bowl over a saucepan of simmering water and whisk over low heat until hot and thick, about 2 minutes. Remove the bowl from the heat. Whisk in the butter, then the cream, crème fraîche, 1 tablespoon of the lemon juice and the lemon zest. Season with salt and pepper. Light a grill or preheat a grill pan. Grill the blanched vegetables over medium heat, turning once or twice, until lightly charred, about 5 minutes. On a platter, toss the arugula with the 2 teaspoons of olive oil and the remaining 2 teaspoons of lemon juice; season with salt and pepper. Arrange the grilled vegetables over the arugula and serve the boiled dressing on the side. The blanched vegetables can be refrigerated overnight. The boiled dressing can be refrigerated for up to 1 week.